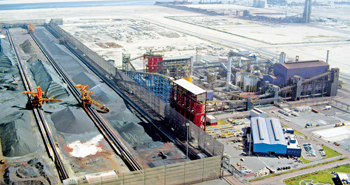 Vale Oman, a major supplier of direct reduction iron ore pellets to steel mills in the Middle East and other parts of Asia, has achieved a record production of 2.41 million tonnes in the second quarter of this year. The plant’s Q2 production surged 27.7 per cent over the previous quarter’s figure of 1.89 million tonnes and 17.7 per cent over Q2 of 2014. The figures were released in a quarterly report of Vale’s worldwide operations. The production spike follows on the heels of a major maintenance shutdown that took place earlier this year, the company said. The output increase in Oman, along with an increase in another Vale-operated pelletising plant in Brazil, helped boost the conglomerate’s total production of iron ore pellets to 12.2 million tonnes during Q2, billed as a new historical quarterly production record for the group. Rio de Janeiro-headquartered Vale SA owns a 70 per cent stake in Vale Oman with the balance held by Oman Oil Company, the wholly Omani government owned strategic and energy investment vehicle. The company has its production facilities at the Sohar Port complex and operates two trains with total capacity of 9 million tonnes annually. As well as the pelletising plant, the company has a distribution centre with a throughput capacity of 40 million tonnes per year.